The Los Angeles Times Bestseller is now available as an e-book. Without awkwardness we would not know grace, stability, or balance. Yet no one before Mary Cappello has turned such a penetrating gaze on this misunderstood condition. Fearlessly exploring the ambiguous borders of identity, she mines her own life journeys — from Russia, to Italy, to the far corners of her heart and the depths of a literary or cinematic text — to decipher the powerful messages that awkwardness can transmit. A thoroughly engaging narrative, by turns alive with humor and opening into delicate estuaries of thought, Awkward: A Detour is a book-length essay that ranges across subjects and conditions as diverse as ontological discomfort and situational silence, immigration and stuttering, tact and its etymological association with touch, the life and work of Rainer Werner Fassbinder, Emily Dickinson and Henry James, as well as the letters that an Italian grandfather wrote to the author but never sent her when she was a child. The book also considers precociousness, prodigiousness and other forms of knowledge out of range and out of bounds, as well as diplomatic and ambassadorial relations between nations and between family members. Awkward: A Detour does all of this through constant and immediate returns to scenes that readers will recognize drawn from the most mundane and significant aspects of daily living. Whether she is meditating on John Kerry’s perceived awkwardness as a determinant in the shape that 21st century history would take, or on the beguiling and seductive aesthetic of an unreadable novel by Henry James, whether she is describing the awkwardness of finding a death certificate of a loved one in a drawer filled with insignificant files or of dissecting a frog without supervision at age 10, whether describing girls, who, in flight from awkwardness, choose to disappear, or children deemed awkward for knowing more than their child bodies or child minds are allowed to contain, Cappello writes with a rapturous and commanding energy. Readers can read Awkward: A Detour in pieces; they can pick and choose the form of awkwardness they wish to engage. But the book is also meant to be read beginning to end, rewarding readers with patterns laid down by an expert weaver, unexpected peaks, and a language that becomes more deeply textured and poignant as it goes. Taking as their impetus the idea of awkwardness as a symptom of an impossibility, the rare and beautiful episodes that make up this book transform that which is awkward into a constellation of becomings. The book is a call, in the end, to be drawn into the space of one another’s untoward longing and misplaced middles, each other’s recalcitrance and each other’s squirm, each other’s immanent and lingering awkwardness. Awkwardness, in Cappello’s hands, becomes in so many ways a condition to be reclaimed and even celebrated for its human possibility. After reading this book, we’ll never be able to consider our quests for harmony and fit in quite the same way, or for that matter the mundaneness of what we thought we’d understood, something so simple as the relationship between the ways human beings talk and the ways they touch. “FINALLY, there is a study of awkwardness in all its many forms: speech, touch, breathing in public, clumsiness. 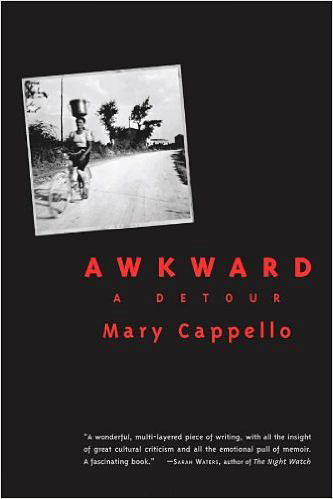 Author Mary Cappello writes of situational awkwardness; of immigration and its attendant awkwardness; of how it pops up between family members, even nations; and of the important place it has assumed in the lives of creative people (Emily Dickinson, Henry James and Rainer Werner Fassbinder, to name a few). » Hear or read Cappello's interview for Quotidiana on writing at the border of poetry and prose, awkward quests, and more. » Read an interview in which Cappello explains the origins of Awkward. » Read Mary Cappello's Guide to Writing "Discursive Autobiography." » Hear Cappello's interview on Illinois Public Radio station WILL's program, Afternoon Magazine, hosted by Celeste Quinn. » Click here to read Mary Cappello's response to Writer's Read. » View D'aughtrice Jackson's experimental film response to Cappello's Awkward Video Challenge. » Read Mary Cappello on Awkward and the lyric essay.